1. 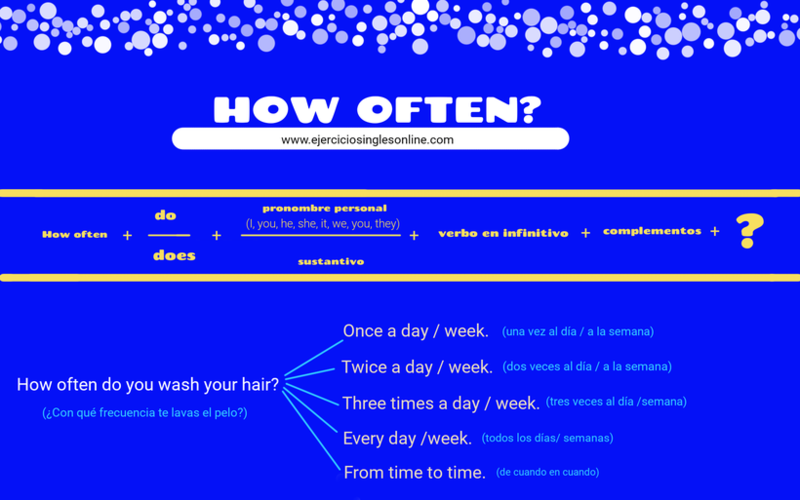 How often does Alice study French? - Twice a week. 2. How often do you drink beer? - Every day. 3. How often do you eat bread? - Three times a day. 4. How often does he go to school? - From Monday to Friday. 5. How often do you drive your car? - Once a week. 6. How often does your best friend visit you? - On Sundays. 7. How often do you play tennis? - Three times a month. 8. How often does she go to the movies? - On Fridays. 9. How often do you paint your house? - Once a year. (¿Con qué frecuencia pintas tu casa?) - Una vez al año. 10. How often do you clean your room? - Every day.